30+ Beautiful Handmade Gifts and $250 Etsy Giveaway! But I rarely do. In fact, during the busy holiday season, chances are even slimmer that I will research the project, buy the supplies and make it at home. Even if I did, the chances that it would be as beautiful as the original are slim. So this holiday season, I’m doing you a favor. Buy it. Buy it beautiful and hand made. And get it free! 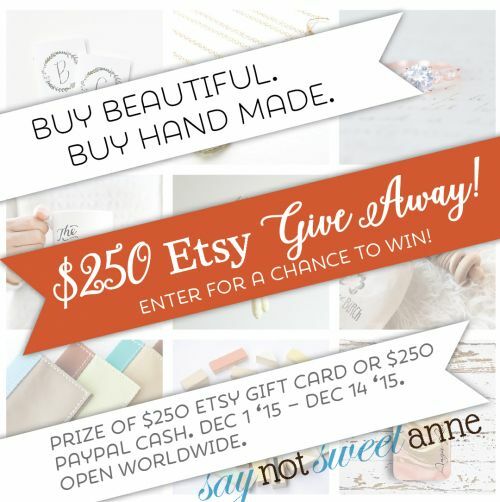 Enter the $250 Etsy giveaway below and spend to your heart’s desire. I’ve even added two curated gift lists for you to choose from. Open world wide. 1 winner will be chosen. Prize must be claimed within 48 hours of announcement or a new winner will be drawn. Prize is not redeemable for cash. Winner can choose $250 PayPal Cash, OR a $250 ETSY Gift Card. All entries will be verified. This giveaway is in no way associated with Facebook, Pinterest, Twitter, Instagram, Rafflecopter, Etsy or any other entity unless otherwise specified. SayNotSweetAnne and other participating bloggers not responsible for delivery of prize. Winner should allow 2+ weeks for delivery of prize. I would love to win this! There are so many things on etsy I love! I would definitely get one of those chunky wool blankets for my mom! A few different sellers have them – they’re so beautiful and soft-looking! There is a really cute Victorian shop I found and they have so many things I would love to have. I would use the card for that. What a lovely giveaway! I’ve had my eye on the gorgeous food illustrations by Kendyll Hillegas on Etsy. What a talented woman! I have no idea what I would buy if I won…Etsy is full of really cool items 🙂 Thanks for the chance to win! I would buy some warm knitted or crocheted items for our newest baby. I’d also buy lots of stickers for my planner. I would buy some nice accessories for myself and some art supplies for my kids. I would probably buy books or jewelry. I would buy decorations for our wedding!! There’s loads of products with Dachshunds on that I love, I would probably get one of those.